Versatile back Wigglesworth is equally adept at scrum-half, fly-half and on the wing. A prominent contributor to the first England Under 21s' Grand Slam winning team in 2004, he was educated at Kirkham Grammar School and joined Sale Sharks Academy in 2001. He had represented England Schools' 18 Group, scored a try for the Under 19s against France and battled his way into the Sale side after facing tough competition from Bryan Redpath and Sililo Martens. The versatile back quickly established himself as a fans' favourite at Edgeley Park, appearing 113 times for the Manchester club. 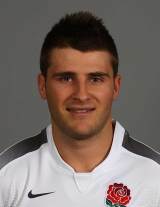 Wigglesworth has five test caps to his name that included a try in England's win over France in Paris in 2008 and his most recent cap came against New Zealand in June of the same year. That proved to be his final cap for England to date, but in January 2010, Wigglesworth announced he would join Sale's rivals Saracens. He enjoyed a brilliant first season at Saracens which resulted in him lifting the Aviva Premiership trophy. England boss Martin Johnson named Wigglesworth in his 45-man training squad for the World Cup in June 2011. An injury to Danny care ensured that Wigglesworth traveled to New Zealand, where made three substitute appearances and one from the bench for England. On his return from international duty he suffered a serious knee injury that ruled him out of action for the rest of the season.